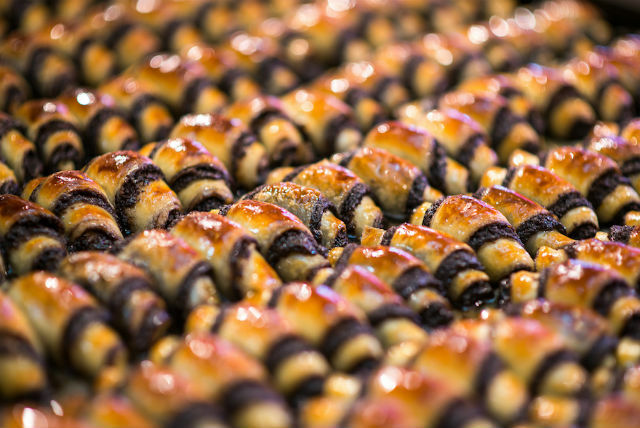 Marzipan Rugelach Now Available in the U.S.
Big news for Marzipan rugelach lovers – the sweet, gooey treats from Israel are now available in several stores in the U.S. according to their website. For many Americans (my husband included) no visit to Israel is complete without a trip (or several trips) to the Jerusalem shuk and a stop at the bakery. Marzipan’s signature rugelach are a bit different from the buttery, flaky version more widely available in the States. Their version is a yeasted dough, seemingly under-baked, and soaked in a sugar syrup when they come out of the oven, resulting in a super decadent, gooey cookie treat. If you’ve never tried one, you might soon find yourself addicted! I promise – you can’t eat just one. Or at least I certainly cannot. Wanna make your own delicious rugelach? Try Joan Nathan’s classic rugelach, s’mores rugelach or cinnamon bun rugelach at home.